This is a no-fuss one pot dinner full of goodness for when it’s cold outside. One pots are so easy to do, and this one is great cold too so if you make a big batch you can use it for lunch boxes in the week. 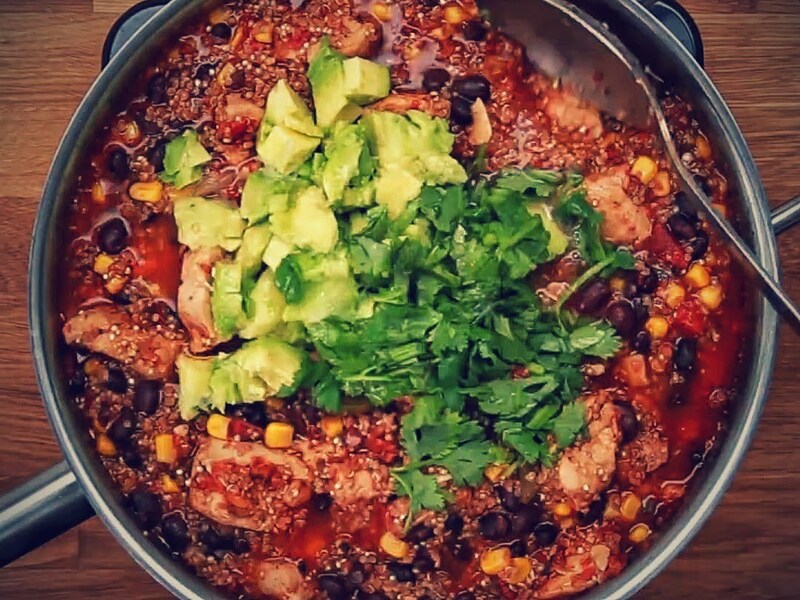 Quinoa is actually a seed and contains extra protein, and we’ve combined it with chickpeas and lean chicken breast so this is another filling but low carb recipe that’s just what your body needs after a tough training session. First, fry off the chicken breasts with the olive oil, season, and add the garlic. Once this is done, all you need to do is tip in all of the remaining ingredients: Quinoa, chilli, stock, chickpeas, tomatoes, sweet corn, cumin and seasoning. Give it a good stir and then cover with a lid. This needs to be simmered really gently for around 30 minutes, with an occasional stir until the quinoa is tender and ready to eat. Serve up and stash any leftovers in the fridge for lunch the next day.